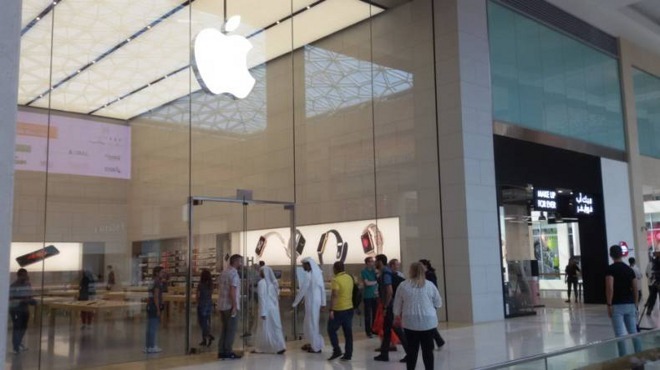 This week, Apple's first two stores in the United Arab Emirates will open their doors to the public, but first looks at the new retail outlets reveal the Dubai store won't be nearly as large as some rumors had speculated. Dubai Apple Store, via Gulf News. 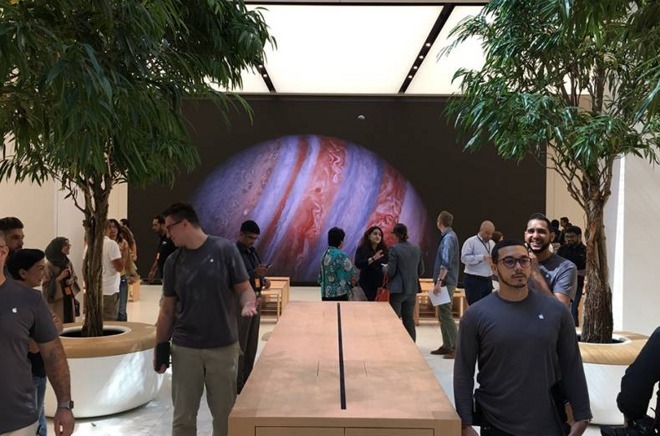 Apple granted members of the media sneak peeks at the new UAE stores, located in Abu Dhabi and Dubai, before they officially open on Thursday. Both of the previews were attended by Gulf News, which estimated that the Dubai location is under 10,000 square feet total. Earlier reports had suggested the Dubai store could be the world's largest, utilizing some 50,000 square feet of floor space inside Mall of the Emirates. But at that estimated size, the Dubai location falls well short of many Apple Stores, including the current world's largest at Covent Garden location in London, measuring 40,000 square feet. While many of Apple's flagship stories feature multiple-story designs, the Dubai location is just one floor. It also boasts natural lighting and trees in the center of the space. Abu Dhabi Apple Store, via Gulf News. Apple also showed off its Abu Dhabi store located at Yas Mall. It features a more traditional mall layout for an Apple retail location, featuring a glass storefront, lighted Apple logo, wooden tables, and a Genius Bar at the back of the store. Both UAE stores are set to open to the public at 7 p.m. local time on Thursday. Apple has become able to set up shop int eh UAE after being granted an exemption from the country's foreign ownership laws. Apple's first-ever store in the Middle East opened in April in Istanbul. It features a giant all-glass cuboid structure atop that serves as a huge skylight for the underground store in Turkey.